South Galway Floods – The goal of this page is to increase awareness of the flooding crisis in South Galway and become a forum for communications relating to the flooding. In 2003, without doing a proper Environmental Impact Analysis for a massive Windfarm on the Slieve Aughty Mountains – the mountain top was clear-felled of 200 Hectares of forestry, over 17km of roads were constructed and 71 turbine bases were constructed, leading to local disaster of a significant landslide. In order to mitigate against further landslides developers imlemented a ‘robust’ drainage scheme and dug up to 30km of deep drains into the mountain top to keep it dry. In 2010, The European Commission issued a final warning over breaches of environmental law. In Jan 2018, the Court of Justice of the European Union (CJEU) issued a statement which indicated that Ireland would face fines of almost €2m. The court stated that even at this late stage, a full EIA must be conducted, which must include full consultation with residents, industry and other relevant stakeholders. The wind farm would then be obliged to take whatever “mitigation” measures and remedial work that such a report recommends. While Ireland had agreed to this back in 2008, the commission says Ireland has not honored part of the 2008 judgment requiring a full EIA. That leads up to last Monday when the CJEU met in Luxembourg on the case. The full contingent of Judges (15) were there to listen to Ireland’s progress since January last year. Martin Collins from Derrybrien, was in attendance and he say that our representatives (Mr Connolly was the Counsel for Ireland) did us no favors in front of the judges. “There was no indication of progress or even clarity of how we proposed to progress. There was a strong sense of frustration from the judges that Ireland continues to ignore these harsh warnings.”, said Martin. The court was also not at all pleased with the fact that Ireland had not acted to implement the earlier judgment and there was quite some disbelief that Ireland could/would not act more decisively against a 95% state owned company. In summary, Ireland has clearly ignored their commitment for 11 years and in recent years the warnings have ratcheted up. The threat is €2 million in fines and €12,000 a day until we fix this and last Monday we came to the party unprepared. The Windfarm developers (ESB) caused the landslide, they were found out by our European Courts and Ireland was slapped with a court order to reassess the Environmental Impacts and put in proper mitigations. Instead of our Minister of Environment doing the right thing and being proactive on this and getting ESB to play ball – we’ve been playing a bullet-dodging game with the European Courts. This is all within Minister Bruton’s call but we’re bumbling it up. The Advocate General’s opinion is due out on 13 June 2019 and the judgment will then follow at some time before the end of this year – and it’s not looking too positive. In the meantime 200 Hectares of clear-felling and 30km of 8ft deep drains promote rapid run-off of water downhill into South Galway – we want to know what the impact is an what they are going to do to help the South Galway communities in our efforts to get a flood relief solution. For Derrybrien , the Derrybrien Development Society wants the same answers to understand the impacts of European’s biggest windfarm in their back yard and how they will mitigate against disasters like we had in 2003. And guess who will be footing this bill when the EU Court comes back? Yep! That would be us the tax payers – This latest bumbling happened on the 1st April and our Government is making us all look like April fools. For More info please read previous articles. In 8th January 2016, I formed this blog because of my frustration with lack of understanding of our situation in South Galway from some comments on my South Galway Floods Facebook page. I wrote What do you expect … when you built on a flood plain? in about 30 minutes in response to comments of the same name, published it and it had over 5000 reads within 24 hours. It highlighted that there were homes 200 years old that were flooding for the first time and that the builders of this didn’t build on a flood plain. However through the mismanagement of the Slieve Aughty mountains, land reclamation and other factors have now added flood risk to areas which weren’t initially prone to flooding. 39 x 3 storey terraced houses. 6 x 2 bed apartments/creche /2 no. shop units in a 3 storey block. All associated site development works to include car parking, riverside walk/access, playground and amenity areas, roads, paths and boundaries/landscaping. This is substantial development and it’s great to see this level of investment in development in Gort. My question – how have they considered flooding? If we superimpose CFRAM maps (flood-risk management maps) from the Gort Local Area Plan 2013-2019, we get the following approximation. Approximate overlay of CFRAM 1:100 flood extent contour on development land. Now that looks real bad! However, it’s not as bad as that though. That flood level is a 1 in a 100 year flood extent (happens on average once every 100 years) and it’s against the existing ground level. The development plans include raising the new ground level as shown in the diagram below. So, in theory, this is on paper looks fine. This is a 1:100 year flood extent and finished floor level there could be approx 15-20 houses is about 1m above this extent, which again, seems reasonable. However, these flood extents are approximate and as we know the complexity of the hydrology of South Galway makes these numbers less accurate. What concerns me is that while the developers did an initial flood risk assessment as a request for information – it didn’t seem trigger anything within OPW when it was first applied for. This assessment was pretty thorough and was completed in March 2009 and gave some extent information as shown here. It also gave the recommendation that Minimum floor levels should be 25m ~about 1m above predicted extent – this was in line with OPW recommendations at the time of 500mm-600mm. In fact we can see here in Winter 2009 water gathering on the site opposite St Colman’s Park in the proposed development site. Another factor is that as this development is raising land around a river bed, will it have an impact – yes – the 2009 analysis said that 1625m3 would be displaced but was not deemed significant (about 48 seconds worth of peak flow) . Maybe in the overall catchment this is deemed negligible but when downstream is given responsibility for taking up this and increased flows through Gort and other areas – they all add up but who is actually adding all of these up? It’s flooding by a 1000 cuts. This kind of development is good for Gort and South Galway and from a flood risk perspective, it does seem to still have a 1m buffer zone which is portrayed as enough – but is this realistic? We should get more realistic flood relief extents at the end of the South Galway/Gort Lowlands Flood Relief feasibility study (End of 2019) and it will be interesting to see if this impacts on on the flood risk of this proposed development. It’s been over 3 years now since South Galway got ravaged by severe flooding and people are wondering if and when a flood relief solution is forthcoming. We are hearing of more delays in the project that will inevitably mean that the risk of getting a major flood event in South Galway is more likely. This is not prophet-of-doom dramatics but a simple statistical probability given the weather events in the past 3 decades combined with these delays. What were some of the reasons for the delays? What is the new timeline? How can our solution providers (Galway County Council and OPW) be more proactive in reducing timelines and risks? Get historical Turlough levels and rainfall events to understand the underground connectivity. Once you have this data, you need the expertise to be able to make sense of this. This expertise is like looking at a spike in a Turlough level like a heart-beat and then listening for a pulse in a series of other downstream Turloughs. The strength of that pulse and its delay (or latency) over hours or days will help build a picture of the underground network which can then be modeled as set of channels with different capacities. To get the accuracy here, this data needs to be collected over several years. There have been several Turloughs monitored over the past 10 years but not enough to build up an accurate picture. Since 2016 GSI have added a large amount of monitors to help get a better picture but again without having peak events, it can be difficult to get accuracy required. GSI was also able to hook into an EU project called Copernicus that took Satellite photos which takes ( 4 photos every 6 days) and has been doing this for the past 6 years across the entire country. These images are being analysed by experts to get approximate the Turlough boundaries. The accuracy is 10m but it can be possible to get accuracy by averaging the boundary. With the topography data is it is therefore possible to get very good accuracy of the change in Turlough Volumes – which is essential for the Catchment Model. For the topography maps, South Galway has (Mostly) been scanned by LIDAR which gives a model of the region down to very fine accuracy/granularity (=> a few inches). This can be used to really understand equating changes in Turlough levels to changes in Volume. It can also be used to understand the Turlough overflows and potential path of water. All of this information is analysed by Trinity College to produce a hydrology model of South Galway. Unfortunately, this is not an easy beast to get right and this has been the main part of the delay. This model was supposed to be ready within a specific time period and to be used by Ryan Hanley but it’s probably taken an extra year to get this to a level of accuracy and calibration that was needed. With historical rainfall , the model can be validated to see how accurate it is compared to the real turlough levels (Caherglassaun below estimates the 2015/2016 flooding response to within 0.1% accuracy. Getting to grips with this beast is the most important part of any flood relief project and that is essentially the main bulk of the work over the past 2 years. We are not done yet because the hydrology model is only used to simulate the catchment response to rainfall. For our Flood Relief process we need to understand the works kinds of floods that we would get on average over 100 years. This is straightforward for a river system but this is a very unique for this kind of project/area. 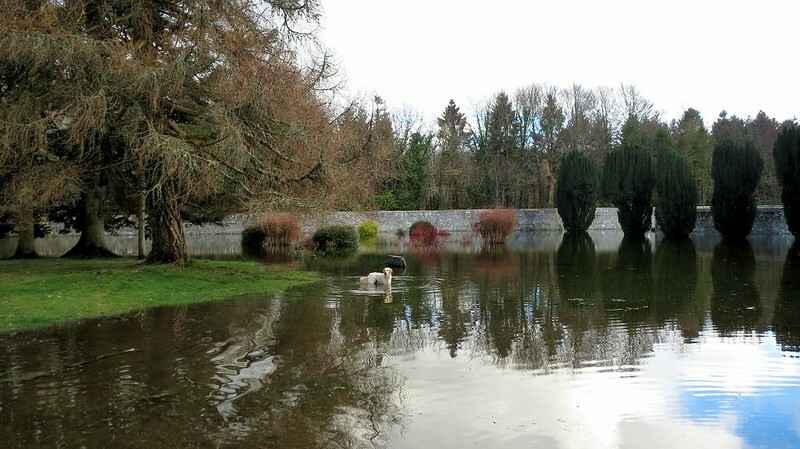 TCD has proposed categorizing flood risks limits according to Turlough boundaries but these are new concepts and the OPW Design section needs to have accept these as standards – which again could cost a delay. So, the getting the model to the level of accuracy needed and developing new ground-breaking concepts all bodes well for a robust solution that will last us in the long term but has caused delays – where does it leaves us in terms of timeframes. The current timeline is running around 1 year late so we’ve slipped by a year within our 1st year which is not boding well for south Galway. If we look at the initial schedule then while it was saying ‘diggers on the ground in 2020’ (it was going to be late 2020) . And this would have had flood relief solutions in place by 2022. This latest timeline is to have a flood relief solution in place by 2023 – so it’s still a year delay – if all goes well … and that’s a big ‘IF’. 2023 would make it a time span of 7 consecutive winters since our last peak flood which is unfortunately not working well in South Galway Communities’ favor. This delay has added another year of dodging a flood and this is stacking up to making it more likely that we will get another flood event before we have a solution in place. The Feasibility study will result in a cost-benefit analysis of the flooding solution which again could have a major impact on the project. One potential effect of having an accurate hydrology model is that we may be able to get a more realistic measure of actual flooding scenarios, with climate change factors added. We suspect that this analysis will show that we haven’t seen the worst floods by a long-shot, and therefore the overall benefit that we would get from a flood-relief solution could rise. In mid-Feb 2019, due to the massive overspend on the cost of the children’s hospital, with the total figure now said to be coming in around €1.4b, it was announced that that OPW would have to shave €3 million from their flooding budget which would be taken from flood relief schemes. Schemes that have already been announced won’t be touched which means schemes that are in development, like the South Galway Flood Relief Scheme, could be. There are other potential risks to the project that will start to emerge – Even though this project will have immense benefit for the environment (See Killing of Coole), it still has to be tick the environmental boxes in the guise of ‘Environmental Constraints’ and will have to be managed like any other project. Mott MacDonald are the Environmental Consultants that have been working on identifying these constraints and working with the design consultants. Note : Ryan Hanley and Mott MacDonald rely on the delivered hydrology model to be able to design and tweak the model to ensure that it fits within the Environment objectives. (Usually defined by the Special Areas of Conservation). Once the solution has been designed then the project will have to go through public consultation which can then bring on it’s own risks and delays. We need Galway County Council and OPW to get on top of the delays and see how can we streamline other parts of the process. Can we speed up the feasibility process? It can take several days to get results from running different hydrology scenarios. Can we use more processing power to get results quicker? Detailed design and ministerial confirmation – this can take 8-12 months (or longer) – what do we need to do to get this done in the 8 months? While the project could start in 2022, what immediate works could have the biggest impact? Can we immediately start to work from the sea back so that some of the solutions come online quicker by winter 2022. What can be done? The clock is ticking and we can’t afford any more delays. Last year, for instance, we had a lot of rain, without any really severe storms and Coole Lake began to reach its peak. For 4-6 weeks we were just one winter storm away from a potential major flooding crisis. This creations anxiety and tension for people who are vulnerable to flooding impacts. The main thing that we all can do is to keep flooding as a top priority for South Galway. For any candidate running for local County Council elections on Friday, 24 May 2019 please consider and ask them the following. If this a re-election for a candidate, in reality how proactive have they been when it came to flood-relief during and since the 2015/2016 floods? If this is a new candidate then where does flooding fit on their agenda? What will these candidates actually do if elected, to keep flooding solutions a high priority in South Galway? We also need our elected Ministers and TDs to re-commit to putting flooding back on the priority list and to we need to remind them that is not OK to divert $3 million of money committed to flood relief to dam up a poorly planned and executed project in another sector. As the canvassing effort gets underway, please ask these questions to ensure that they will keep flooding as a top priority for South Galway.